Over the last few decades, the world has witnesses a booming number of mobile phones, in which HTC and Samsung respectively account for 12.7% and 14.2% of the mobile phone brands in the market and have a profound influence on people's lives. Needless to say, mobile phones have continued to be the leading tool for people to remain in contact with friends, family and loved ones even they are thousands of miles away. At the same time, people must notice that one of the latest innovations to come out on mobile phones is the ability to watch movies and TV shows on them. So it's not surprising that you can find many people are immersing themselves in watching videos on their HTC One M8, Samsung Galaxy S7, etc online while they are commuting on a bus or train or waiting in line in your daily routine. Of course, it's handy to watch movies on your mobile phone online. What if you cannot access to internet or want to watch your new DVD movies on mobile phone? It's a known fact that the phones are not equipped with DVD drives. Shouldn't it be better if you get your movies off DVDs and play them on the mobile phone directly? In this case, you need to rip DVD to mobile phone compatible format like 3GP first. In case you want to convert DVD to mobile phone like Nokia, Motorola, HTC, Blackberry, it's necessary for you to choose a reliable and professional DVD to mobile phone converter to satisfy your need. Here MacX DVD Ripper Pro, especially designed for Mac users, is worth a shot. This DVD ripper for mobile phone works perfectly in ripping DVD movies to mobile phone supported format 3GP at fast speed while holding superb video quality. Apart from getting movie off DVD for playback on mobile phone, you can also create perfect copy of your favorite DVD with original video quality and original 5.1 channels Dolby AC3/DTS audio in few minutes. Therefore, you don't have to worry about your fragile DVD collections scratched and covered with jam. After free downloading this DVD to mobile phone converter on Mac, click "DVD Disc" button to import the DVD movie you want to rip. You can also load DVD folder by clicking "Path" button. Since you want to watch DVD movies on mobile phone, here you can choose "to HTC" or "to Samsung" as output video format. This DVD ripper for Mac also helps to rip DVD to iPhone 7/7 Plus/6s/Plus compatible format. As long as you click "to iPhone" and choose the profile of your need, then you can play top 2015 movies on iPhone on the go with this DVD ripper for mobile phone. After finish the above steps, click the "Start" button to start ripping DVD movies to mobile phone on Mac OS (DVD to Huawei Mate 10/Pro), you could view the conversion progress and are able to cancel the converting process at anytime. BTW, if you desire to play the ripped DVD movie on iPhone iPad iPod, you can use MacX MediaTrans to transfer videos from computer to iDevices for replaying with ease. Note: this DVD ripper for mobile phone has been upgraded to take a brand new DVD navigator analysis scheme, providing a unique solution for latest encrypted DVD amongst similar products. Thus even the latest released DVD can be decrypted and ripped on Mac with ease. For those who are longing for converting video to mobile phone, MacX Video Converter Pro works like a charm to get all prepared on your Mac and helps to put any videos to the formats that suit your mobile phone you like with a couple of clicks. Notice: We only advocate using this best DVD ripper to rip commercial DVDs to mobile phones under the concept of Fair Use and do not encourage any illegal reproduction or distribution of copyrighted content. Please abide by the local DVD copyright law before doing it. In this article you will get a step-by-step guide on how to rip DVD to HTC, and watch DVD movies on Android based HTC phones like HTC One with best video quality using DVD to HTC ripper on Mac. Watching DVD on Google Nexus 5 directly can be a little tricky due to the devoid of DVD drive. But this article show you how to rip DVD to Google nexus 5 playable format using MacX DVD Ripper Pro to help you play DVD on this gadget on the go. If you are looking for a way to rip DVD for playback on LG G2, your search will end with MacX DVD Ripper Pro. This DVD ripper software helps to rip any copy protected DVD to LG G2 on Mac OS X, so that you can play DVD movies on LG G2 freely. 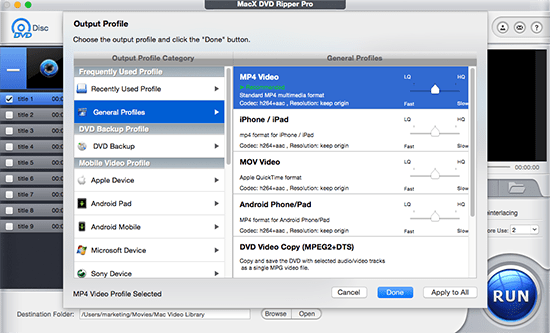 MacX DVD Ripper Pro is the best DVD to mobile phone ripper for Mac which can freely rip DVD to MP4, MOV, M4V mobile phone supported formats and backup any DVD disc, ISO image, DVD folder on Mac (MacBook Air/Pro, iMac etc) in 1:1 quality with original quality.